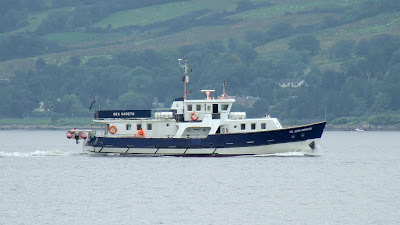 A training vessel belonging to the Sea Cadets has been on the Clyde for the past few days. The T.S. JOHN JERWOOD was built for the organisation thanks to a grant of £1,216,700 from the Jerwood Foundation. Equipped to accommodate 12 cadets and eight officers /senior rates, the hull of the 23.5 metre long vessel was moulded in GRP in Sri Lanka, then brought to the UK for fitting out. She has two Perkins diesel engines, and is usually based at Gosport, although she regularly saild around the coast of Britain with Sea Cadets aboard.